NW cnr Balfour & Bathurst Streets. Google Maps. The application for the Jolly Butchers had special features. 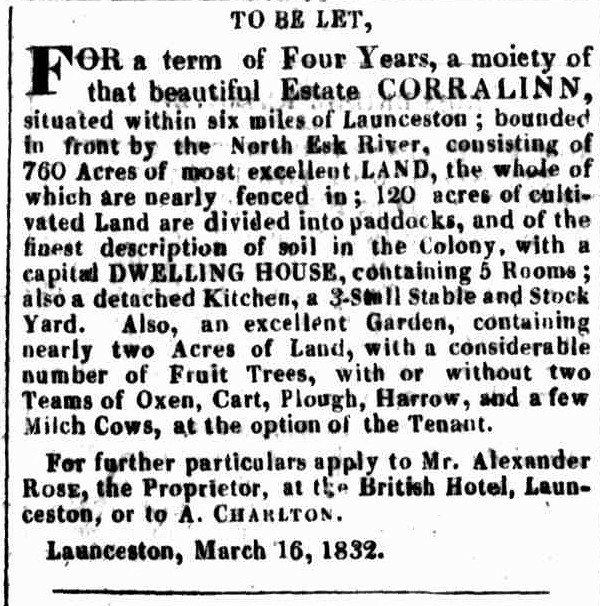 The house had been established for a number of years, and the tenant, Mr. Walsh, wished to purchase it when it was offered for sale by public auction, but the biddings did not reach the reserve, and then Mr. Walsh. proceeded to build the Centennial Hotel on the opposite side of the street and asked for a new license. Mr. E. Byron Miller appeared in support of Mr. Bachfield’s application, which was deferred until that of Mr. Walsh’s was before the bench, when, after deliberation, the application of Mr. Bachfield was refused, for the Jolly Butchers premises, although the proprietor had promised to re-model the premises so as to adapt them to modern requirements. NE corner of Wellington & Balfour Streets. Google maps. 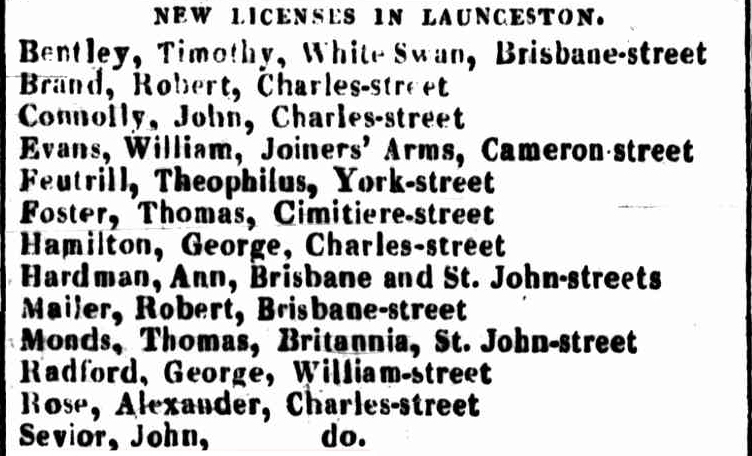 Home to what seems to have been Launceston’s first theatre (1834, see advertisements below). 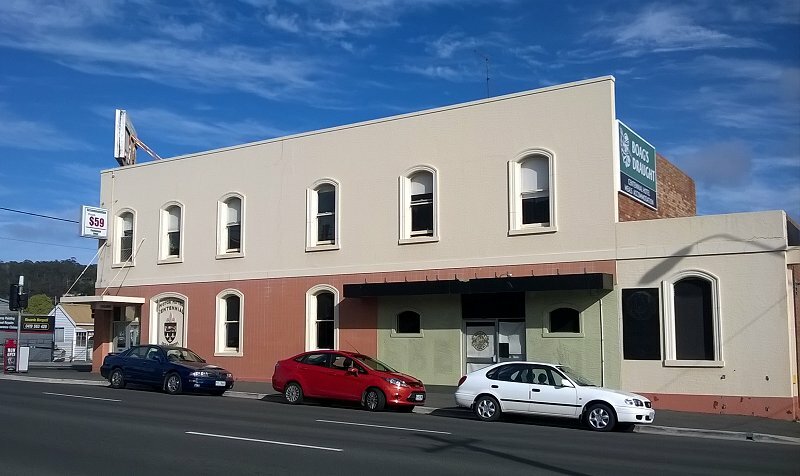 Became the colonial hospital in the early 1840s, and then the public Cornwall Hospital until the construction of the Launceston General Hospital in 1863. 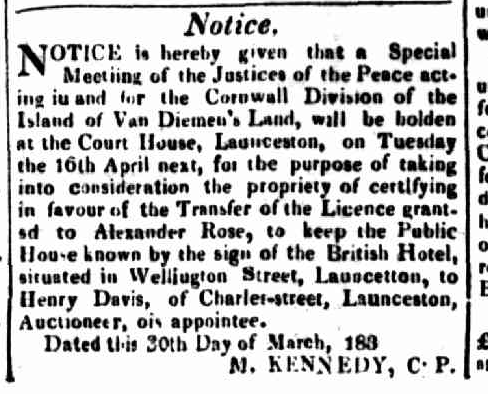 Although this says Charles St, the license is granted for the following year (1832) and Rose is signing himself as the proprietor of the British Hotel, Wellington Street in May 1832 (see first ad below).